The ECB would be blind not to acknowledge the cyclical upswing in the Eurozone. Growth in the first quarter was stronger than in the US and UK and confidence indicators are close to all-time highs. What is more, the recovery is broadening across countries and sectors. With political risks subsiding, prospects for investment to pick up should also improve. Up to now, the ECB has been cautiously avoiding sounding overly optimistic, but a further change of the risk assessment from downward to balanced looks like a done deal. While the economy strengthens, inflationary pressure is still hard to find. The latest drop in headline inflation and, even more importantly, continued low underlying inflation, suggest that deflationary risks might have disappeared, but the ECB is still far away from reaching its inflation objective. The combination of stronger growth and very little inflationary pressures should also be reflected in the ECB’s staff projections, which is also due to be published next week. While the effect of a stronger euro exchange rate and lower oil prices should net off each other in terms of growth, it could actually lead to a downward revision of the ECB’s inflation projections for 2017-19 by c.0.2ppt each year. Back in March, the ECB projections predicted inflation to come in at 1.7%, 1.6% and 1.7%, respectively, in these three years. 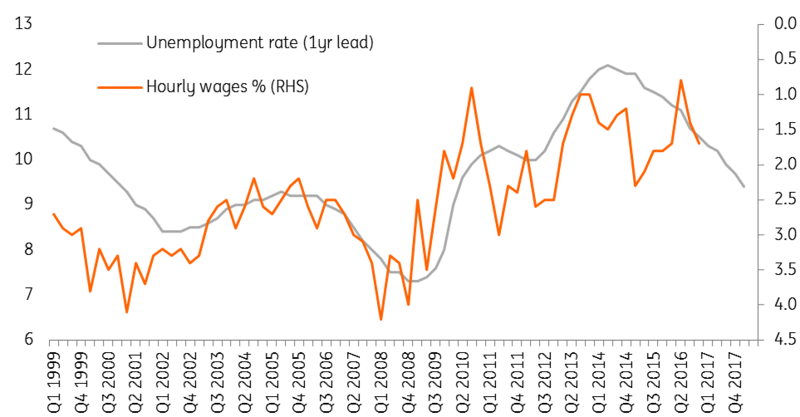 Going forward, the single most important variable for the ECB to decide on significant policy changes will be wages. Draghi has repeatedly called it the ECB’s lynchpin. The German experience, with nominal wage increases of a decent 2-3%, and the US example, with low wage increases despite unemployment rates of c.5%, show that it can take a while before wage development in the Eurozone signals an ECB policy move. On top of domestic factors like ageing, still-high unemployment and negative output gaps, broader factors like digitalisation and globalisation should continue exerting disinflationary pressure on the Eurozone. Looking back, the ECB started QE to tackle deflationary risks. These risks have clearly disappeared. However, conversely, this does not mean that the ECB already stands ready to unwind QE. In the ECB’s own analysis, the current upswing is still highly dependent on monetary stimulus. In addition, the ECB seems afraid that any taper signals could lead to a ‘taper tantrum’ as in the US and an unwarranted increase of interest rates. Exiting QE is much more complicated than entering it. Therefore, we expect the ECB to announce first subtle changes to its risk assessment and forward guidance at next week’s meeting. This could be followed by tasking the working committees to study several options for tapering, maybe even including the sequencing, at the July meeting. The official tapering communication could then follow between September and December. The ECB does not seem to be in any rush to drastically change its current stance and will do everything possible to avoid a taper tantrum; probably with a ‘taper tiptoeing’.